Google is experimenting with a new tool that will call people on your behalf, holding entire conversations to set up appointments, order food, arrange meetings and much, much more. 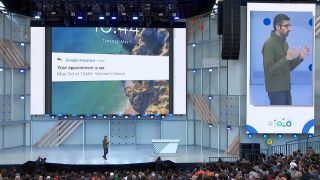 Built into Google Assistant, the new technology that was unveiled at Google IO is called Google Duplex and will call real life people and businesses based on it understanding your requests. You won't listen to the call either - instead, Google Duplex works in the background and gives you a notification when it has arranged a booking for you. It calls the person using the Google Assistant voice, and is even able to insert pauses, grunts and "uh-huhs" in order to make the call recipient believe it's talking to a human. Google showed an example on stage that showed someone asking Google Assistant to call a hairdresser and make an appointment for a woman's haircut at 12PM. The Google Assistant then found the phone number, called the hairdressers and arranged the appointment without any extra interaction. The voice assistant could even handle extra requests such as a change in the time and difficult questions about what the person wanted. In the example, Google suggested that the person on the end of the phone didn't know they were talking to a voice assistant either. In this restaurant booking scenario, Duplex successfully handled requests where meaning was open to interpretation, and navigated politely through a conversation with somewhat confused front of house restaurant stuff. It's easy to think of the use cases for Duplex, but this technology could also be misused too and it'll be interesting to see how Google hopes to secure the feature in the future. It's bad enough getting a prank call from a human, let alone an AI. An exact release date for Google Duplex is unconfirmed. This looks like future tech and often things are unveiled at Google IO that are a long way off, so don't expect to be able to do this within Assistant any time soon. Find out more at the Google blog.